This Sunday’s worship format is a little different. On Christ the King Sunday–the final Sunday of our church year–we remember each season of the year in word and song as we prepare our hearts to begin anew. Hear our prayers, spoken and silent, that we commend to you this day, trusting in your abundant mercy, through Jesus Christ, King of kings and Lord of lords. ADULT FAITH FORMATION SERIES – We’ve began our dive into the exciting, action-packed book of Acts! This morning we’re finishing chapter 1, where we read about the actions of the church’s first Nominating Committee. Intrigued? Join us between services, 10:15 to 10:55 am, in the Library. CHILDREN’S SUNDAY SCHOOL – for kids ages 4-10 will meet in the Youth Room between services and is designed for any child to drop in at any time. Come join the fun this week or any Sunday! NEXT SUNDAY – SINGLE SERVICE & ADVENT SMORGASBORD – Join us for a festive and delicious Cross of Christ tradition – our Annual Smorgasbord luncheon, which will be held immediately following the 10 am combined service. Please sign up at the Information Desk in the Narthex to attend and to help with the meal. You may either bring a potluck item (salad, side dish, rolls, main dish, dessert) or contribute money towards the purchase of turkey and ham. For more information, or to volunteer to help, please contact Linda Capron at 425-898-0263, capron@comcast.net. HOPELINK GIVING TREE – will be in the Narthex beginning today. Gifts can be donated until Sunday, December 9. Your generosity has brightened Christmas for countless girls and boys over the years. Thank you in advance for considering this important ministry. CALLING ALL LECTORS! – Please consider signing up online to read a lesson in one of our upcoming worship services. It greatly adds to our worship and helps with planning when a variety of voices volunteer to be lectors. To save your spot, go to http://www.crossofchristbellevue.org/volunteer-sign-up/ . Thanks! ADVENT READERS & CANDLE LIGHTERS – One very meaningful tradition for Sundays in Advent is the lighting of the candles on the Advent Wreath. This year, an original Advent-themed liturgy – “Home Coming” – has been created for this special part of our worship. Readers and candle lighters are needed for all services on the Sundays in Advent: December 2 (10 am only), 9, 16 and 23. 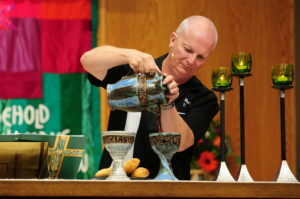 Please connect with Pastor Dave to be a part of this year’s beautiful Advent celebrations. MEMORIAL FOR REV. WINSTON BONE – will be held at Cross of Christ on Saturday, December 8, at 11 am, in the Sanctuary, followed by a luncheon reception in the Fellowship Hall. Rev. Bone was an ELCA pastor for more than 50 years. He was father to member Alma Constable, wife of Brian. Please keep the family in your prayers. “BACK TO WORK” CLOTHING DRIVE FINAL SORT & BOX – Volunteers are needed for the final push as we sort and box the last of the donations and send them on their way to local shelters, transitional housing facilities, social services organizations, and thrift stores that support the homeless and poor of the Eastside. The Packing Party will be this Thursday from 2 to 6 pm. Pastor Dave is bringing boxes and music. Let him know if you can come help. Thank you! CAROLERS NEEDED FOR HOMEBOUND VISITS – Help spread some Christmas cheer and joy this season as we sing carols and seasonal hymns for members unable to come to worship. Information about places, dates, and times, and a signup (or should we say sing-up!) sheet are at the Information Desk in the Narthex. Contact Pastor Judy with questions at 502-415-5883. BOX TOPS FOR EDUCATION – Pastor Judy is collecting box tops for the PTA of her children’s school throughout the year. They can be found on various boxes, like Cheerios, Kleenex, etc. Just clip them out and stick them in her mailbox. Thanks! CORN AND RICE BAGS FOR SALE – Pastor Judy and volunteers have been making these lovely bags that can either be heated in the microwave or kept in the freezer for warm or cold therapy. Some are designated for homebound and other members in need. But others will be for sale over the next few weeks for a suggested donation of $5. Proceeds will go toward purchasing new embroidered Cross of Christ aprons for our kitchen and volunteering opportunities. These handmade bags would make great holiday gifts or stocking stuffers! Thanks to those who have already picked some up. Contact Pastor Judy to learn more.